* I recycled a Starbuck's Frappuccino bottle and filled it with Peppermint flavored M&Ms. * I made a label from this pretty blue plaid paper and added a row of white pom poms to the upper and lower edges. * The snowflake is from the Silhouette Online Store. After cutting it out, I inked up the edges with blue ink and covered it with some Martha Stewart Coarse Glitter. 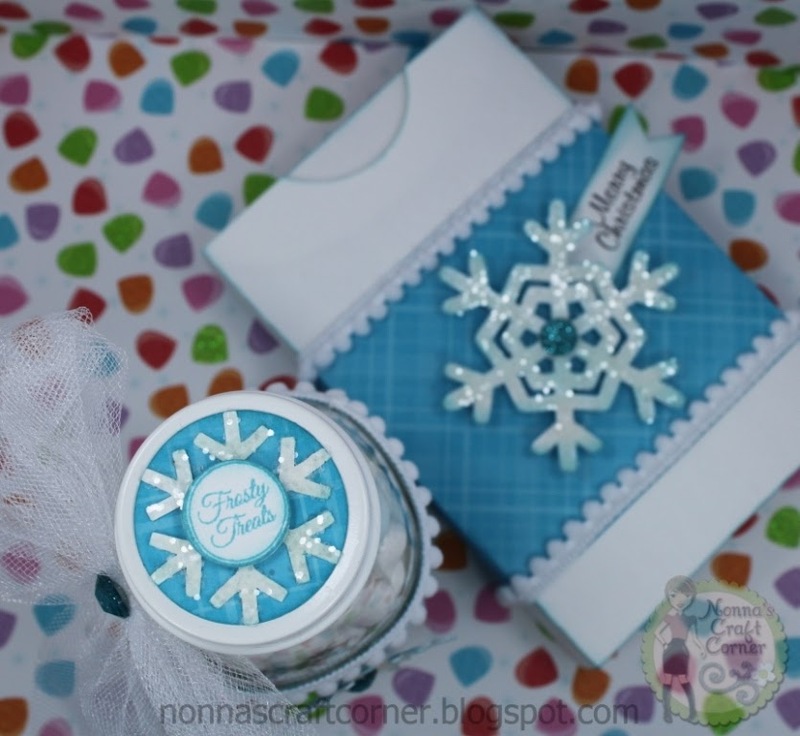 * The glittery blue gem in the center of the snowflake is from "The Paper Studio"
* I added a white tulle bow around the neck of my bottle and a gem in the center of the bow. * The box is also from the Silhouette Online Store and gets the same pretty blue paper and white pom pom trim along with a glittery snowflake. 2 packs of cocoa fit perfectly into this box. * The "Merry Christmas" sentiment is from the "Christmas Wishes" stamp set by Jaded Blossom. It is stamped onto a flag cut with the "Flag Die" also by Jaded Blossom. * The lid to my Frappuccino bottle is topped off with another snowflake and a sweet sentiment from Jaded Blossom's "Winter Candies" stamp set. 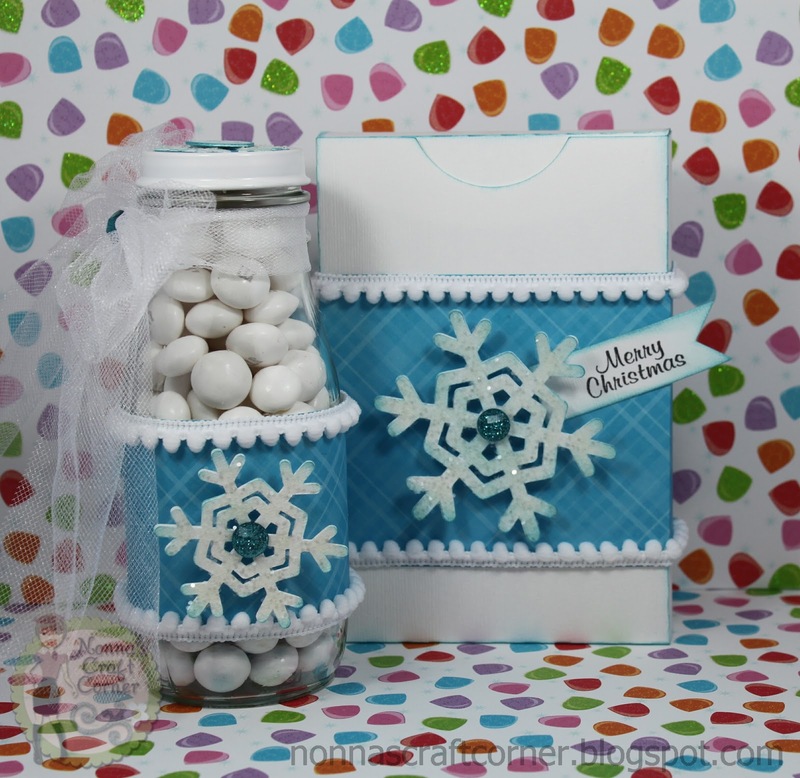 Create any type of project featuring BLUE & WHITE. Ok - it's your turn now! I hope you will stop by the Pause Dream Enjoy Challenge Blog and check out all the fabulous projects the Design Team has put together for you. Then...go get creative and link up your project with us. I can't wait to see what you create! Before I go, I would like to thank everyone for their concern and sweet words about my recent puppy bite! It is healing nicely and looking better each day. I will have stitches for several more days, but it is becoming more and more flexible. I also wanted to let you all know - this project and all the ones before it were completed before the bite! I think a few of you thought I had made these with my poor, mangled up finger! Fortunately, I had a few projects ready to post before hand! After this one however....mangled finger and all! So, again, thanks for your sweet words and thanks for stopping by today. I hope you have a wonderful weekend and I'll be seeing you soon! Wonderful altered gift item & gift box. Have been wondering what to do with the StarBucks Frap Bottle my daughter broke home. Maybe I can ge ton your Christmas List and Santa would bring me a gift like this. What a wonderful gift - love those snowfalkes! Have a great weekend. I'm so glad to hear your finger is healing! Stitches arent fun :( You project is fabulous! I love all the glittery goodness on your snowflakes and the pom pom trim....adorable!! 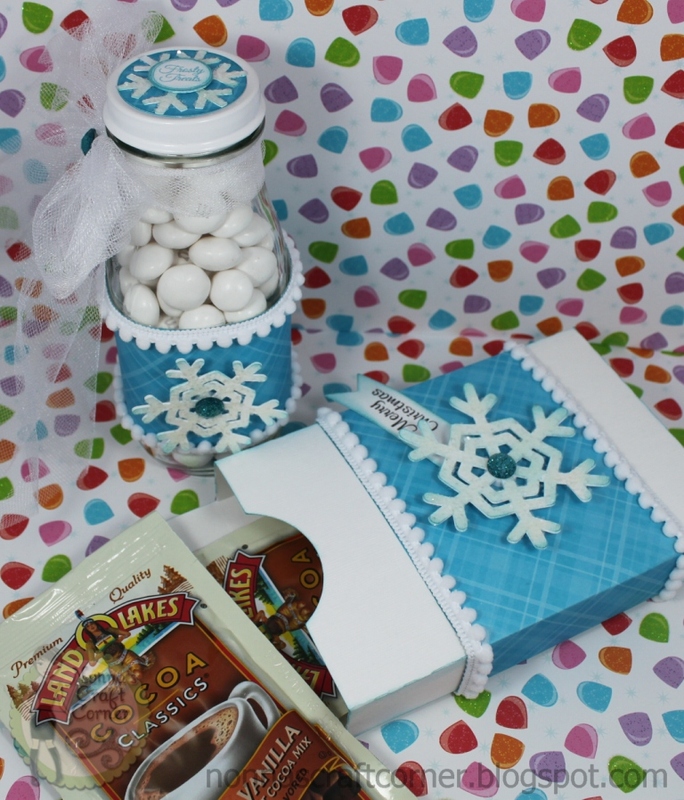 What a delightful gift and I love, love the blue and white combo. Such a cute idea - hmmmm, wonder if I have time . . . .
You've simply outdone yourself :) Love it! So beautiful and such a FUN project! I love the colors and such a fabulous gift idea:) TFS! Congrats on your top 3 at PK-woot-woot! Very Beautiful Projects! !Love the Snowflake! Congrats to you & Glad to know that you are feeling better! Such a pretty set. I love this color combo. Just love everything about things set the snowflakes are so pretty. Fabulous blue and white project. Love your blingy snowflakes. Glad your finger is healing nicely. Beautiful!!! Love it and thank you for sharing this wonderful idea with us all! Tanya ~ Oh my this is just way to CUTE and CLEVER!! I LOVE that little box with the hot chocolate packs in it! Then you recycled that Starbucks jar too! I am just LOVING the blu and white this year!! Simple PERFECTION! Looks like your poor little finger didn't keep you down too long! Have a wonderful weekend! Tanya this is great! I love everything about it!